Among world regions, the number of unauthorized immigrants from Asia, Central America, and sub-Saharan Africa rose between 2009 and 2014. 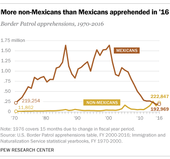 The number from Mexico has steadily declined since 2007, the first year of the Great Recession, but Mexicans remain more than half (52%) of U.S. unauthorized immigrants. Vast segments of the United States increasingly are becoming ethnically diverse, creating what William Frey, author of "Diversity Explosion: How Racial Demographics are Remaking America" terms a "cultural generation gap." But, note researchers at the Brookings Institution, that diversity is concentrated in distinct American regions, largely in areas bordering the nation's three coasts. To better document such trends, the Brookings Institution has created an interactive map charting demographic changes by age throughout the nation.